Dr. James A. Matas recently revealed the launch of his practice’s new adaptable website, which offers an easily navigable interface and modern design elements. Orlando, FL— Aspiring to provide an enhanced browsing experience for patients researching cosmetic procedures online, Dr. James Matas, a plastic surgeon in Orlando, recently unveiled the launch of his practice’s new responsive website. 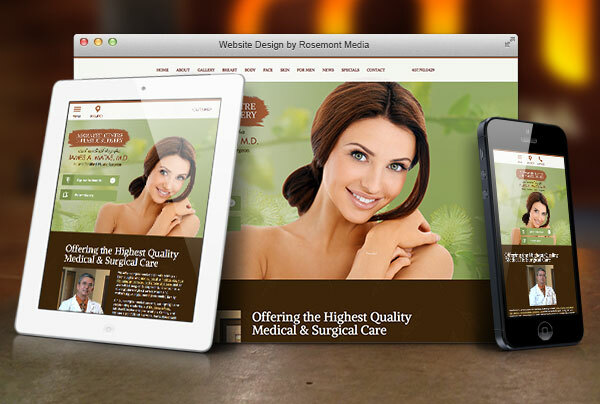 Developed in collaboration with medical website design firm Rosemont Media, the site’s improved functionality and aesthetically pleasing layout offers individuals utilizing Internet-compatible mobile devices convenient access to medical and practice information while on the go. As a result of the responsive formatting, Dr. Matas believes more patients will have round the clock access to pertinent medical content on aesthetic procedures for the breasts, body, face, and skin. The innovative adaptable layout for the Advanced Centre for Plastic Surgery website automatically adjusts to fit the screen dimensions of any mobile-friendly device, including laptops, smart phones, and tablets, as well as traditional desktop computers. To further enhance the user experience, the site’s homepage features popular design elements called parallax scrolling and fixed background scrolling, both intended to elevate the aesthetic appeal of the practice website. The upgraded site also employs the latest medical SEO strategies to help increase the practice’s online visibility, which can assist patients in discovering the information they are seeking more easily. Ultimately, Dr. Matas wants to create a welcoming online destination for visitors and believes well-informed patients often will be more satisfied by their cosmetic outcome. With his modernized site, he strives to provide a detailed resource on facial and body rejuvenation in an enjoyable format. Certified by the American Board of Plastic Surgery, Dr. Matas is a plastic and reconstructive surgeon practicing in Orlando. He received his undergraduate degree from the University of Notre Dame before earning his medical degree from the University of Miami. He then completed fellowships in Hand Surgery and Aesthetic Plastic Surgery, followed by residencies in General Surgery and Plastic Surgery. A recipient of numerous accolades, Dr. Matas is also an active member of several esteemed medical associations, including the American Society of Plastic Surgeons, the American Society for Aesthetic Plastic Surgery, and the Florida Medical Association. He is available for interview upon request. For more information about Dr. Matas and his plastic surgery practice, please visit yournewlook.com and facebook.com/pages/Dr-James-A-Matas-Advanced-Centre-for-Plastic-Surgery/202214226477819.